This weekend was truly remarkable in many ways. I attended a childhood friend’s wedding in Waynesville, NC (about 30 minutes outside of Asheville) on Saturday and I had a chance to hang out in Asheville a little bit on Saturday and Sunday. I had not been since I was in high school, so I was pleasantly surprised that the town had progressed so far in the 20+ years it has been since my last visit. While I was visiting, I happened upon a cool coffee shop with an attached store called A Far Away Place that sold spiritual artifacts, stones, scrolls, books, etc. The shopkeeper Kathleen helped me pick out the perfect wedding gift on Saturday, and when I returned to thank her on Sunday, she suggested I check out this place nearby that she called the boulder fields. She gave me the name of a town and another shop to visit that would help me find the place, as it was one of those ‘locals only’ spots. I followed the directions that the guy in the shop gave me and I ended up at a trail head on the mountain opposite Chimney Rock Park. Now, I love a good adventure – especially when it involves going somewhere remote where nobody else is going to be. It turns out that Chimney Rock Park is quite popular – especially Memorial Day weekend, so I was delighted to discover something totally away from all of that madness. I started up the trail and quickly got to a fork. I picked my path and started to hike. 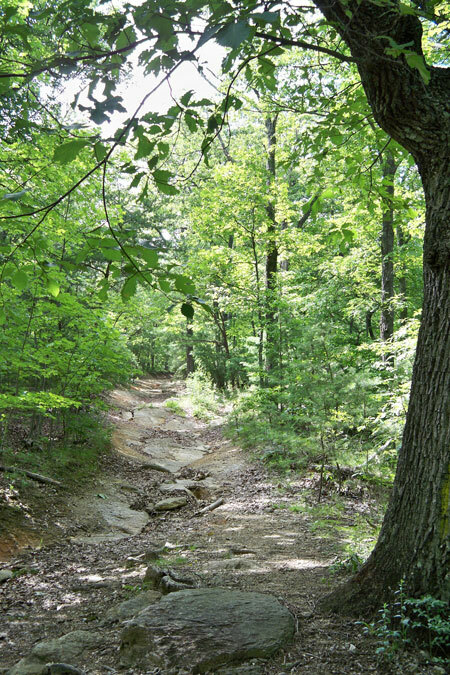 The trail was wide and rocky, but had deep gulleys where rains had eroded the soil extensively. I didn’t have proper hiking shoes at the time, but I made the best of it. 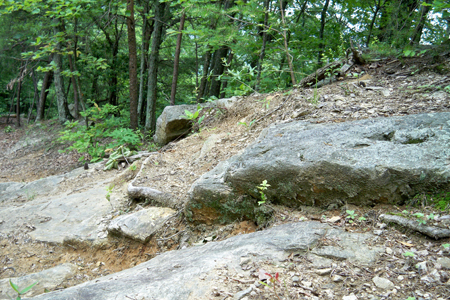 As I ascended, the trail got steeper and more rocky. Eventually the clouds that I saw forming across the ridge opened up and I got a refreshing Spring shower. My thoughts turned toward the eroded trail and I decided to head back down in case the rain got really bad. Not long after I started back down, it stopped raining and I decided to take a quick break in a clearing about 1/4 way down the mountain. I sat on a huge rock in the middle of the trail and began to eat the clementines that I had brought along for a snack. It was then that I met the ants. I noticed a couple of ants crawling around where I was sitting, but then I realized that one ant had a piece of a leaf or something that it was dragging across the trail. Whatever the thing was it was carrying was about 4 times its size, yet it never let go of it, regardless of the obstacle. I watched intently as this ant pulled the leaf through seemingly impossible terrain. At one point the ant ascended a rock that was at a 90+ degree angle to the trail (the rock on the right in the picture below). The ant never let go of the leaf. While I was watching this ant and marveling at its dedication, I softened my focus just slightly and suddenly I noticed other ants around me. Not right beside me, but far out in my peripheral vision. I could see them all concurrently – their movements seemed to be in unison, although they were not in close proximity to each other. I noticed flies, gnats, bees, and various other insects buzzing about. All of this I noticed just by sitting still and becoming Present. The best way I can describe it is that there was a symphony of movement all around me that I never would have noticed had I not stopped and sat perfectly still for those few minutes. I thought about the ant that was dragging the leaf and the movement of all of the ants and insects together, and it seemed to be telling me something. First, it was amazing to watch this tiny ant pulling something much larger than itself, but then when it got to an obstacle that I was sure would divert it from its path, it kept going anyway. What this ant achieved was incredible from my perspective. Then, the collective movements of all the creatures that were in complete harmony with the forest reminded me that we are all connected to each other and to the Earth. I believe the lesson that I was there to learn is that no matter what the odds seem to be in our lives, we can overcome them if we are dedicated. Right now, there are challenges around the world that seem to be daunting at first glance. Pick your crisis – there are several. For instance, the oil spill disaster in the Gulf of Mexico – it seems hopeless sometimes when we see the devastating images, and many of us are asking if it is really worth gambling with our environment in the name of oil. It seems that we are at a critical point on our path – perhaps even an inflection point, and we would be well served to remember the dedication and perseverance of the ants as we turn our attention toward alternative energy sources. All of us have our work and our struggles, and we can achieve remarkable things when we hold the vision and keep moving through the difficult times. I’ve seen this play out in my own life time after time. I am so thankful for the opportunity to have the experience out on the mountain this past weekend. It’s moments like this that remind me why I like to return to the woods as often as possible.